Taj MuttHall Dog Diary: Are Some Things More Important Than Agility? SUMMARY: Weddings? Graduations? Death's Door? Amusement parks? Hmm. Update: 6/6/09 3p.m. : Two parenthetical observations in [square brackets]. Team Small Dog today got me going on the observation that they attended a wedding this weekend "because some things are more important than agility." I found that I had lots to say, hence this yere post. I'd agree that some things are more important than agility, but what if I am already entered in an agility trial and I have paid my money and I am all ready to go? Hmmmm. So I started thinking about me and some things that might be more important than agility. I once missed a wedding for an agility trial, but it was a stealth wedding. My cousin sneaked off to Las Vegas or Morocco or somewhere and got married with no one there, and then came home and told us very quietly. A while later, they invited us to a BBQ at their place, and I said, sorry, already entered in an agility trial for that weekend, because BBQs are definitely not on the list of things more important than agility, even though free food is involved. Well, it turned out that they invited all family members from all around the universe and actually did a real wedding ceremony and had a cake and everything. So I missed it. But I'd have blown off at least half a day of agility to go if they had bothered to tell me what it was for! Because wedding cake is definitely more important than agility. 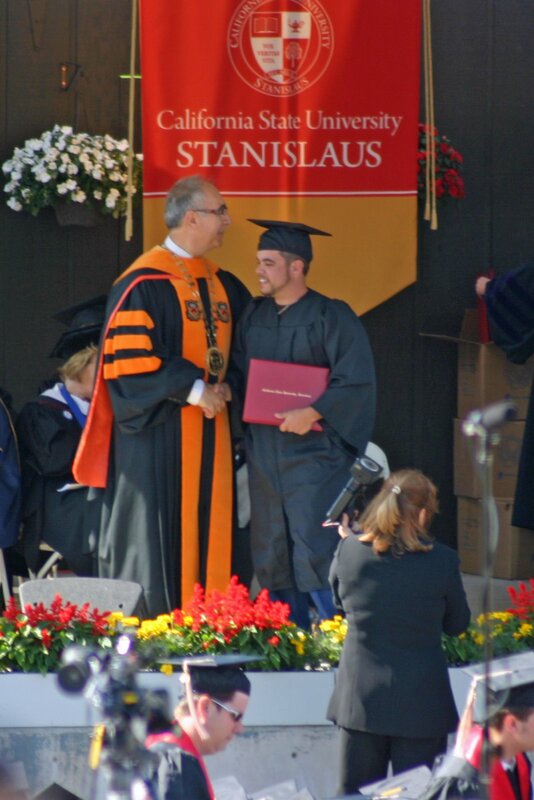 I once missed one whole run in agility to go to my nephew's graduation, because he had the courtesy to graduate from a college in Turlock first thing in the morning on a weekend where there was agility in Turlock. What a considerate nephew. Turns out that I was almost the only one in the family who got there in time to take photos. Because I was already there for agility. What a considerate agility show. So there are some things more important than agility, but we get back to agility as quickly as we can, like in time for the 2nd walk-through. Then there was the time--twice actually--when my mom went into the hospital right immediately before an agility trial, and I fretted tremendously and the angst flowing from my brain could have filled the Metrodome, but my #1 sister was being a superb mom-hospital-health-manager plus I had 2 additional emergency backup sisters right there in the area, and I was providing no useful services whatsoever except periodically sending emails to all known relatives. So I said I guess I'd go to agility anyway, if they thought they could manage without me, since it was only 2 hours away and I actually do own a cell phone although I try not to admit it. One of the very few times in known history when I carried a turned-on cell phone with me for 2 days, even at the score table, and my excellent #1 sister called me periodically to give me cheery updates so that I could indulge my agility fantasy unencumbered by family worries. So you can see that, of all the things that are more important than agility, in fact I have no photos of because I wasn't there. Hrm. I have SEEN photos, but can't now find the links to them. Ah, well. But here's the thing: I am blowing off an actual Bay Team agility trial in November to go to Disneyland. Because some things just ARE more important than dog agility. I don't think it was that; cousin said that they didn't want people to feel obligated to show up with gifts because they already had plenty of stuff, or feel that they had to show up when the invite was pretty much last minute. So they told her parents, I gather, but no one else, about the stealth wedding. Yeah, LL, I blame this on you. But I must tell you, I am ****SO**** looking forward to going. I wouldn't think twice about blowing off agility to go to Disneyland. Take a spin on the teacups for me and be sure not to barf.